Day 2 of the festival features two female-driven vocal powerhouses. Niyaz seamlessly blends medieval Sufi poetry and folk songs from their native Iran along with a guest whirling Dervish dancer. Emel Mathlouthi’s gorgeous, intricate sound moves between rock, trip-hop, and electronica, giving light to her reputation as one of the great divas of the Arab World. 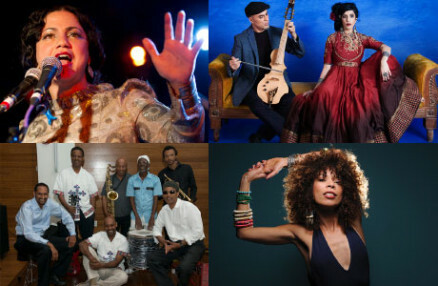 The final night of the festival features Flavia Coelho, who has electrifying stage presence and unique Brazilian sound, followed by Guayo Cedeño + Coco Bar, serving Latin surf guitar melodies from Honduras. Cedeño will also be joined by the renowned Garifuna singer/songwriter Aurelio Martinez on guitar and vocals and Garifuna drums.